For other uses, see Receptor (disambiguation). Receptor proteins can be classified by their location. Transmembrane receptors include ion channel-linked (ionotropic) receptors, G protein-linked (metabotropic) hormone receptors, and enzyme-linked hormone receptors. Intracellular receptors are those found inside the cell, and include cytoplasmic receptors and nuclear receptors. A molecule that binds to a receptor is called a ligand, and can be a protein or peptide (short protein), or another small molecule such as a neurotransmitter, hormone, pharmaceutical drug, toxin, or parts of the outside of a virus or microbe. The endogenously designated -molecule for a particular receptor is referred to as its endogenous ligand. E.g. the endogenous ligand for the nicotinic acetylcholine receptor is acetylcholine but the receptor can also be activated by nicotine and blocked by curare. Each receptor is linked to a specific cellular biochemical pathway. While numerous receptors are found in most cells, each receptor will only bind with ligands of a particular structure, much like how locks will only accept specifically shaped keys. When a ligand binds to its corresponding receptor, it activates or inhibits the receptor’s associated biochemical pathway. Type 1: Ligand-gated ion channels (ionotropic receptors) – These receptors are typically the targets of fast neurotransmitters such as acetylcholine (nicotinic) and GABA; and, activation of these receptors results in changes in ion movement across a membrane. They have a heteromeric structure in that each subunit consists of the extracellular ligand-binding domain and a transmembrane domain where the transmembrane domain in turn includes four transmembrane alpha helices. The ligand-binding cavities are located at the interface between the subunits. Type 2: G protein-coupled receptors (metabotropic receptors) – This is the largest family of receptors and includes the receptors for several hormones and slow transmitters e.g. dopamine, metabotropic glutamate. 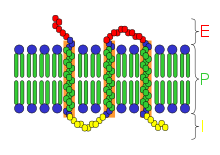 They are composed of seven transmembrane alpha helices. The loops connecting the alpha helices form extracellular and intracellular domains. The binding-site for larger peptide ligands is usually located in the extracellular domain whereas the binding site for smaller non-peptide ligands is often located between the seven alpha helices and one extracellular loop. The aforementioned receptors are coupled to different intracellular effector systems via G proteins. Type 3: Kinase-linked and related receptors (see “Receptor tyrosine kinase” and “Enzyme-linked receptor“) – They are composed of an extracellular domain containing the ligand binding site and an intracellular domain, often with enzymatic-function, linked by a single transmembrane alpha helix. The insulin receptor is an example. Type 4: Nuclear receptors – While they are called nuclear receptors, they are actually located in the cytoplasm and migrate to the nucleus after binding with their ligands. They are composed of a C-terminal ligand-binding region, a core DNA-binding domain (DBD) and an N-terminal domain that contains the AF1(activation function 1) region. The core region has two zinc fingers that are responsible for recognizing the DNA sequences specific to this receptor. The N terminus interacts with other cellular transcription factors in a ligand-independent manner; and, depending on these interactions, it can modify the binding/activity of the receptor. Steroid and thyroid-hormone receptors are examples of such receptors. Membrane receptors may be isolated from cell membranes by complex extraction procedures using solvents, detergents, and/or affinity purification. The structures and actions of receptors may be studied by using biophysical methods such as X-ray crystallography, NMR, circular dichroism, and dual polarisation interferometry. Computer simulations of the dynamic behavior of receptors have been used to gain understanding of their mechanisms of action. Ligand binding is an equilibrium process. Ligands bind to receptors and dissociate from them according to the law of mass action. One measure of how well a molecule fits a receptor is its binding affinity, which is inversely related to the dissociation constant Kd. A good fit corresponds with high affinity and low Kd. The final biological response (e.g. second messenger cascade, muscle-contraction), is only achieved after a significant number of receptors are activated. Affinity is a measure of the tendency of a ligand to bind to its receptor. Efficacy is the measure of the bound ligand to activate its receptor. (Full) agonists are able to activate the receptor and result in a strong biological response. The natural endogenous ligand with the greatest efficacy for a given receptor is by definition a full agonist (100% efficacy). Partial agonists do not activate receptors with maximal efficacy, even with maximal binding, causing partial responses compared to those of full agonists (efficacy between 0 and 100%). Antagonists bind to receptors but do not activate them. This results in a receptor blockade, inhibiting the binding of agonists and inverse agonists. Receptor antagonists can be competitive (or reversible), and compete with the agonist for the receptor, or they can be irreversible antagonists that form covalent bonds (or extremely high affinity non-covalent bonds) with the receptor and completely block it. The proton pump inhibitor omeprazole is an example of an irreversible antagonist. The effects of irreversible antagonism can only be reversed by synthesis of new receptors. Inverse agonists reduce the activity of receptors by inhibiting their constitutive activity (negative efficacy). Allosteric modulators: They do not bind to the agonist-binding site of the receptor but instead on specific allosteric binding sites, through which they modify the effect of the agonist. For example, benzodiazepines (BZDs) bind to the BZD site on the GABAA receptor and potentiate the effect of endogenous GABA. Note that the idea of receptor agonism and antagonism only refers to the interaction between receptors and ligands and not to their biological effects. A receptor which is capable of producing a biological response in the absence of a bound ligand is said to display “constitutive activity”. The constitutive activity of a receptor may be blocked by an inverse agonist. The anti-obesity drugs rimonabant and taranabant are inverse agonists at the cannabinoid CB1 receptor and though they produced significant weight loss, both were withdrawn owing to a high incidence of depression and anxiety, which are believed to relate to the inhibition of the constitutive activity of the cannabinoid receptor. Mutations in receptors that result in increased constitutive activity underlie some inherited diseases, such as precocious puberty (due to mutations in luteinizing hormone receptors) and hyperthyroidism (due to mutations in thyroid-stimulating hormone receptors). The central dogma of receptor pharmacology is that a drug effect is directly proportional to the number of receptors that are occupied. Furthermore, a drug effect ceases as a drug-receptor complex dissociates. Ariëns & Stephenson introduced the terms “affinity” & “efficacy” to describe the action of ligands bound to receptors. Affinity: The ability of a drug to combine with a receptor to create a drug-receptor complex. Efficacy: The ability of a drug-receptor complex to initiate a response. Agonist: A drug with a fast association and a fast dissociation. Partial-agonist: A drug with an intermediate association and an intermediate dissociation. As a drug approaches a receptor, the receptor alters the conformation of its binding site to produce drug—receptor complex. In some receptor systems (e.g. acetylcholine at the neuromuscular junction in smooth muscle), agonists are able to elicit maximal response at very low levels of receptor occupancy (<1%). Thus, that system has spare receptors or a receptor reserve. This arrangement produces an economy of neurotransmitter production and release. Cells can increase (upregulate) or decrease (downregulate) the number of receptors to a given hormone or neurotransmitter to alter their sensitivity to different molecule. This is a locally acting feedback mechanism. Change in the receptor conformation such that binding of the agonist does not activate the receptor. This is seen with ion channel receptors. Uncoupling of the receptor effector molecules is seen with G-protein couple receptor. Receptor sequestration (internalization). e.g. in the case of hormone receptors. Many genetic disorders involve hereditary defects in receptor genes. Often, it is hard to determine whether the receptor is nonfunctional or the hormone is produced at decreased level; this gives rise to the “pseudo-hypo-” group of endocrine disorders, where there appears to be a decreased hormonal level while in fact it is the receptor that is not responding sufficiently to the hormone. The main receptors in the immune system are pattern recognition receptors (PRRs), toll-like receptors (TLRs), killer activated and killer inhibitor receptors (KARs and KIRs), complement receptors, Fc receptors, B cell receptors and T cell receptors. ^ a b c Hall, JE (2016). Guyton and Hall Textbook of Medical Physiology. Philadelphia, PA: Elsevier Saunders. pp. 930–937. ISBN 978-1-4557-7005-2. ^ a b Alberts B, Bray D, Hopkin K, Johnson A, Lewis J, Raff M, Roberts K, Walter P (2014). Essential Cell Biology (Fourth ed.). New York, NY, USA: Garland Science. p. 534. ISBN 978-0-8153-4454-4. ^ Congreve M, Marshall F (March 2010). “The impact of GPCR structures on pharmacology and structure-based drug design”. British Journal of Pharmacology. 159 (5): 986–96. doi:10.1111/j.1476-5381.2009.00476.x. PMC 2839258. PMID 19912230. ^ Qin K, Dong C, Wu G & Lambert NA (August 2011). “Inactive-state preassembly of G(q)-coupled receptors and G(q) heterotrimers”. Nature Chemical Biology. 7 (10): 740–7. doi:10.1038/nchembio.642. PMC 3177959. PMID 21873996. ^ a b Rang HP, Dale MM, Ritter JM, Flower RJ, Henderson G (2012). Rang & Dale’s Pharmacology (7th ed.). Elsevier Churchill Livingstone. ISBN 978-0-7020-3471-8. ^ Milligan G (December 2003). “Constitutive activity and inverse agonists of G protein-coupled receptors: a current perspective”. Molecular Pharmacology. 64 (6): 1271–6. doi:10.1124/mol.64.6.1271. PMID 14645655. ^ Ariens EJ (September 1954). “Affinity and intrinsic activity in the theory of competitive inhibition. I. Problems and theory”. Archives Internationales De Pharmacodynamie Et De Therapie. 99 (1): 32–49. PMID 13229418. ^ Stephenson RP (December 1956). “A modification of receptor theory”. British Journal of Pharmacology and Chemotherapy. 11 (4): 379–93. doi:10.1111/j.1476-5381.1956.tb00006.x. PMC 1510558. PMID 13383117. ^ Silverman RB (2004). “3.2.C Theories for Drug—Receptor Interactions”. The Organic Chemistry of Drug Design and Drug Action (2nd ed.). Amsterdam: Elsevier Academic Press. ISBN 0-12-643732-7. ^ Boulay G, Chrétien L, Richard DE, Guillemette G (November 1994). “Short-term desensitization of the angiotensin II receptor of bovinde adrenal glomerulosa cells corresponds to a shift from a high to low affinity state”. Endocrinology. 135 (5): 2130–6. doi:10.1210/en.135.5.2130. ^ a b c d e f g h i j k l Boulpaep EL, Boron WF (2005). Medical physiology: a cellular and molecular approach. St. Louis, Mo: Elsevier Saunders. p. 90. ISBN 1-4160-2328-3. ^ Waltenbaugh C, Doan T, Melvold R, Viselli S (2008). Immunology. Philadelphia: Wolters Kluwer Health/Lippincott Williams & Wilkins. p. 20. ISBN 0-7817-9543-5.